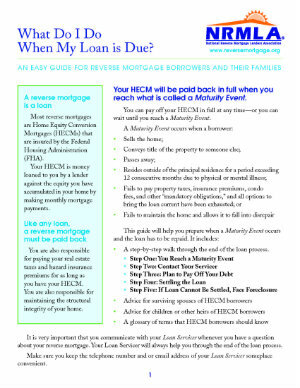 Home » Reference Section » What Do I Do When My Loan is Due? The National Reverse Mortgage Lenders Association created, “What Do I Do When My Loan is Due?,” to walk reverse mortgage loan borrowers and their families through the end of the loan process when it is time for the loan to be repaid. This guide will help your clients prepare when a Maturity Event occurs and the loan has to be repaid. A step-by-step walk through the end of the loan process.